Can You Guess the Jurisdiction that Is Ending Special Pension Advantages for Government Bureaucrats? A government has just announced that it is going to end the unfair practice of giving government bureaucrats pension benefits that are far greater than those available for workers in the economy’s productive sector. Can you guess which jurisdiction took this important step, notwithstanding the greed, political sophistication, and power of government bureaucracies? Is it the federal government in Washington, which provides bureaucrats with much higher levels of overall compensation than workers in the private sector? Is it Ireland, which a few years ago actually cut bureaucrat salaries by more than 13 percent? Is it California, which is infamous for over-compensated bureaucrats? Is it Denmark, which has the world’s most expensive bureaucracy? Is it Italy, which has some of the most coddled government bureaucrats in the world? Is it New Jersey, where it’s possible for a bureaucrat to have six government jobs at the same time? Is it the Cayman Islands, which actually contemplated the imposition of an income tax to finance its bloated bureaucracy? Is it Portugal, which overpays bureaucrats more than any other nation? Those jurisdictions are all be good guesses. Or, to be more accurate, that’s a good list of jurisdictions where reform is desperately needed. But all those guesses are wrong. The nation that is ending special pension privileges for government bureaucrats is the People’s Republic of China. Yes, you read correctly. A communist-run nation is implementing this pro-market reform. Here are some of the details from CNTV. China will reform its public sector pension system to reduce disparity between the public and private sectors, Vice-Premier Ma Kai said Tuesday… Under China’s dual pension system, civil servants and employees in state agencies do not need to pay for their pensions — the government provides full support for them. 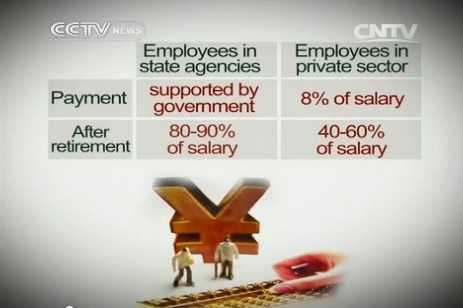 But employees of private enterprises have to pay 8 percent of their salary to a pension account. 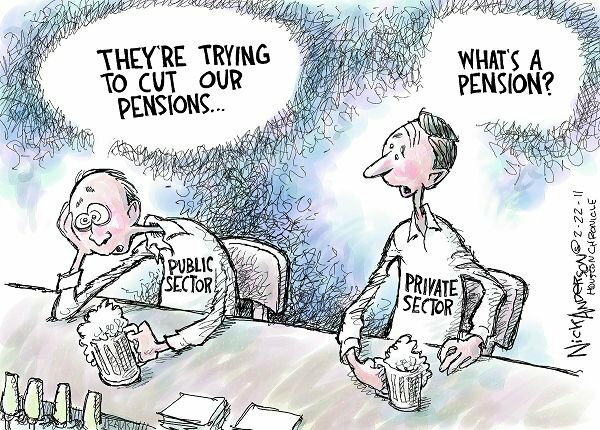 After retirement, private urban employees usually get a pension equal to about half of their final salary, but civil servants get much more without making any financial contribution. …now the reform is coming. The aim is to build a system for Party, government and public institution staff that is similar to the one used by the private sector. This move will affect around 37 million people: 7 million civil servants and 30 million public institution staff. Wow, bureaucrats will have to live under the same rules as folks in the private sector. What a radical concept! Maybe we could even try it in the United States at some point. By the way, one additional indirect feature of the story is worth a mention. China actually has the beginnings of a private Social Security system. Because the system is still developing, I don’t put it on my list of nations with private Social Security (though it is on the Social Security Administration’s list), but the goal is to slowly but surely shift to a funded system. Assuming that actually happens, China could mitigate the fiscal consequences of a very large demographic crisis caused by that nation’s barbaric one-child policy. In any event, China’s at least moving in the right direction (see here, here, and here for more information), which is more than can be said for the United States. P.S. While China has moved in the right direction in recent decades, it still gets a relatively low score from Economic Freedom of the World. Which helps to explain why I think it’s silly for people to fear the supposed Chinese Tiger. P.P.S. If you want to see far more striking examples of Chinese people being successful, check out Hong Kong and Taiwan. P.P.P.S. Though at least some Chinese government officials have a very perceptive understanding of the European welfare state.